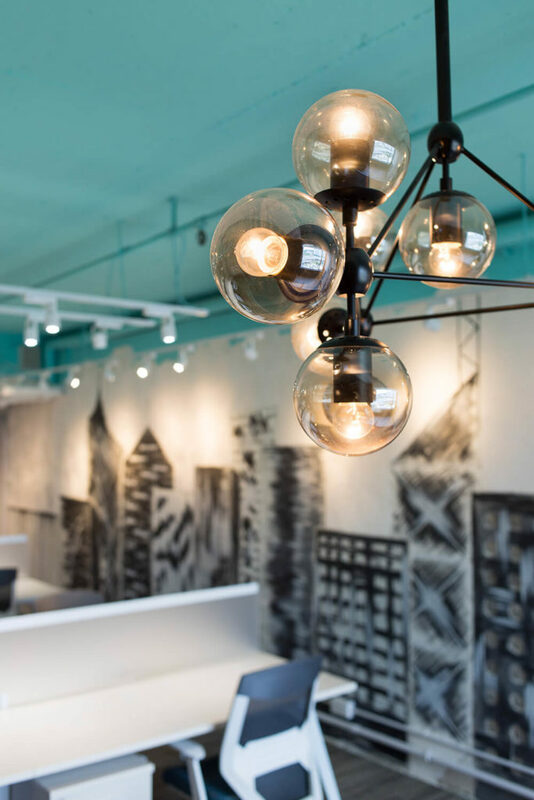 The lighting includes chandeliers like this, featuring an interconnected set of smoked spheres and black metal piping. 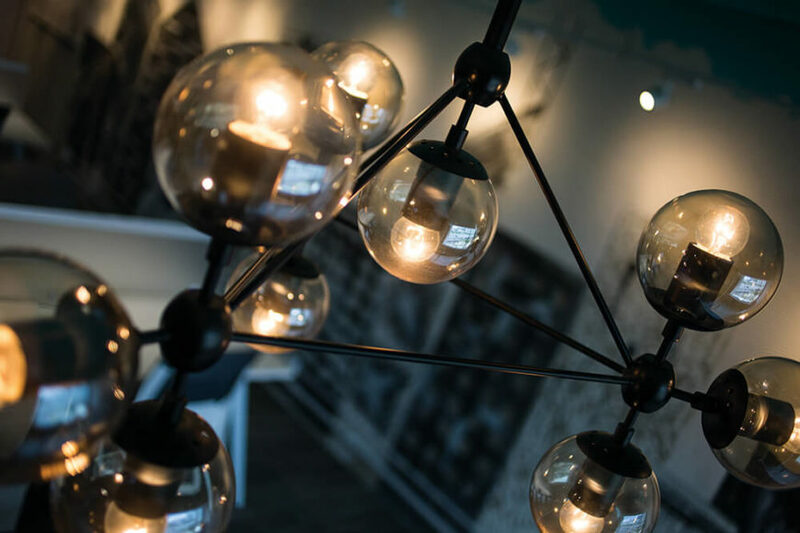 It turns the traditional notion of a chandelier on its head. 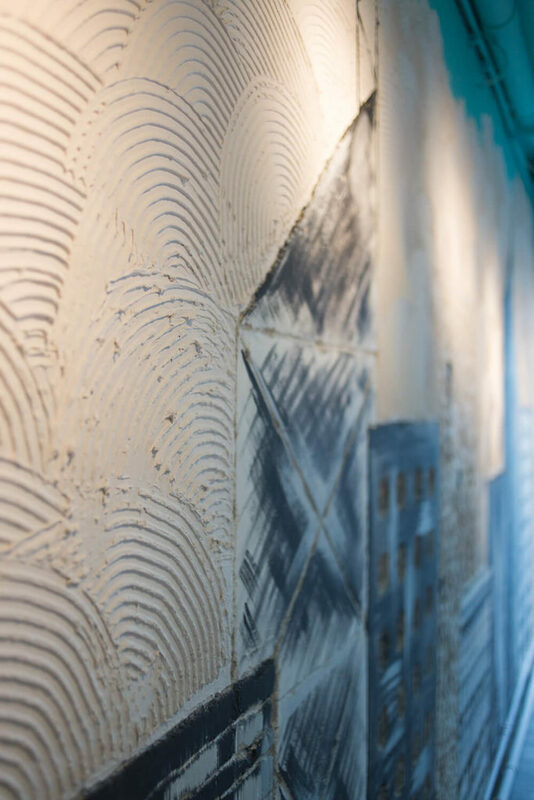 Glancing down from the lights, we see the richly detailed walls, painted artistically as if it were a broad canvas. Beyond lending personality and charm, it ensures the utter uniqueness of the space. 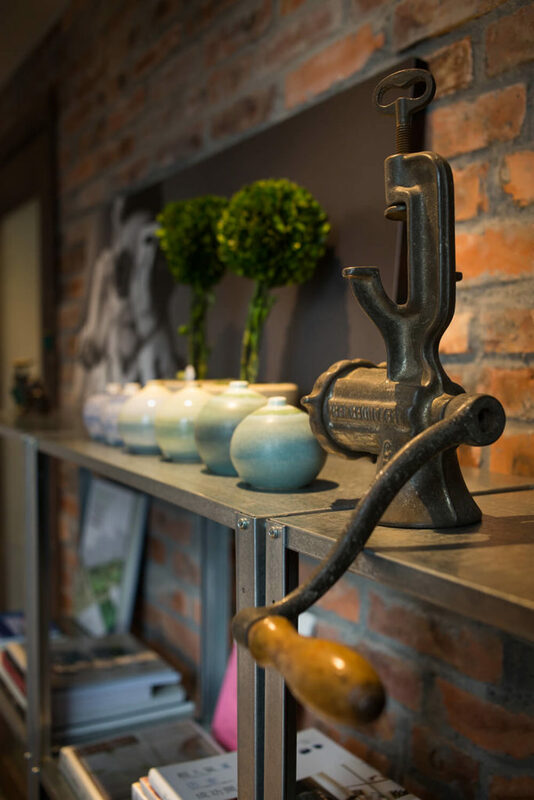 With hardwood flooring and brick walls in this relaxing corner of the office, the environment feels entirely divorced from the bright white and blue space of the main room. 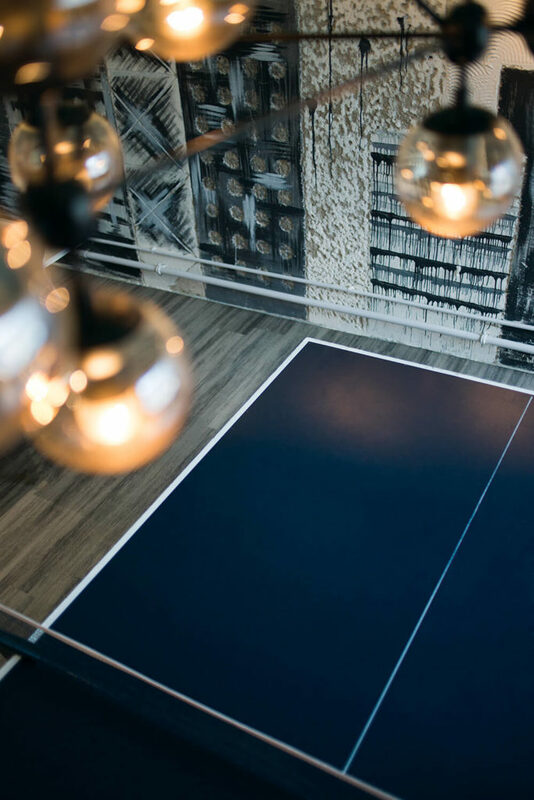 A ping pong table highlights the sense of fun inherent in the design. 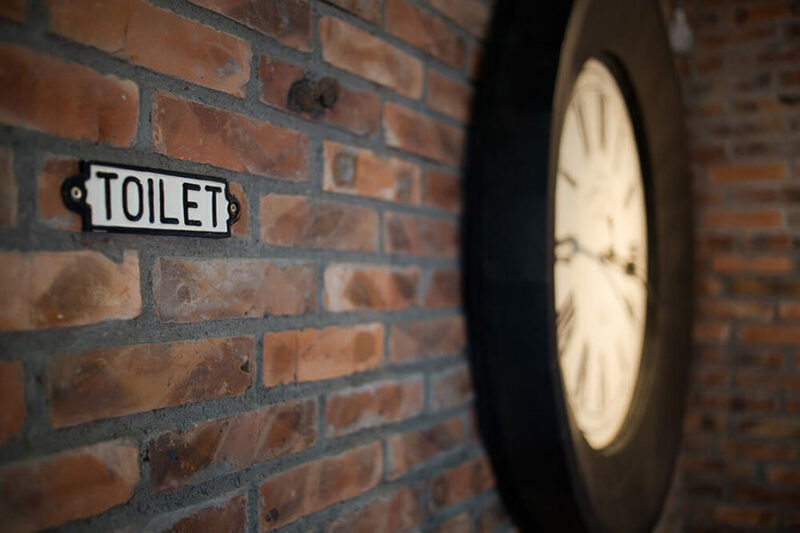 As the old fashioned sign for the bathroom indicates, this area takes a detour through historical style. 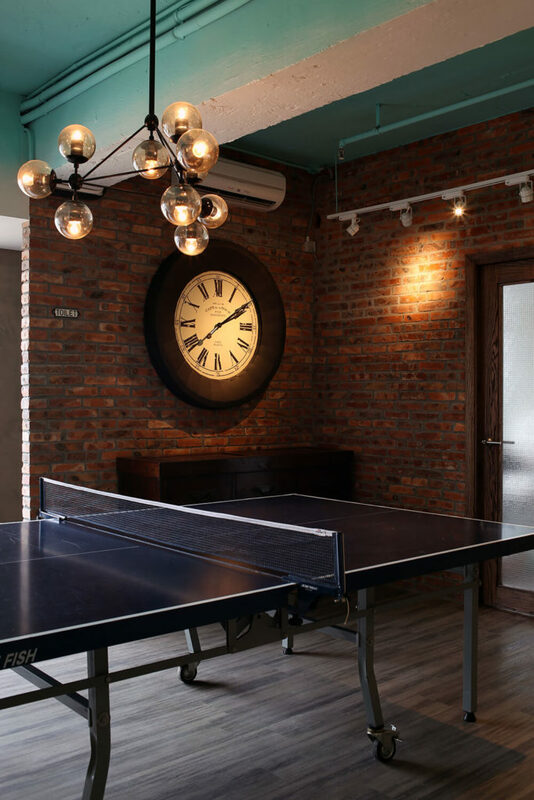 Red brick walls set the tone, while a large traditional face clock hangs to the right. 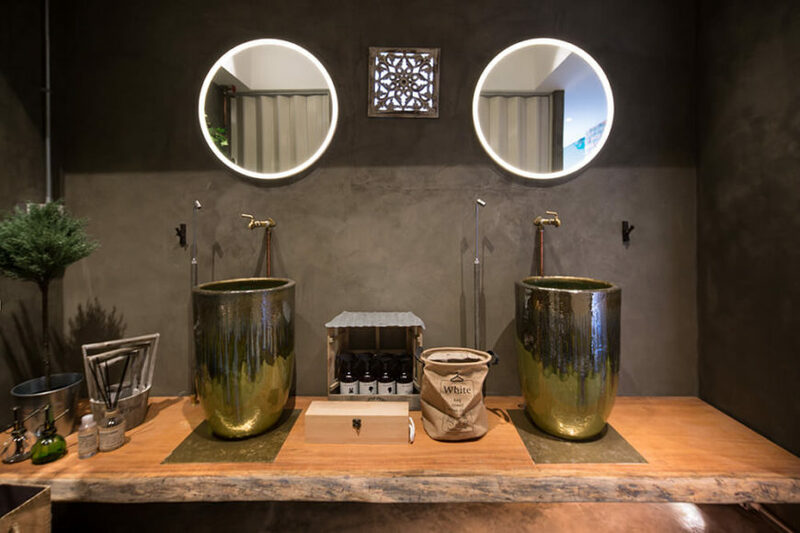 The centerpiece of the bathroom is this floating single slab natural wood vanity that houses a pair of stained metal vessel sinks. The sinks appear in a breathtaking vertically oriented shape, the likes of which we’ve never seen before. 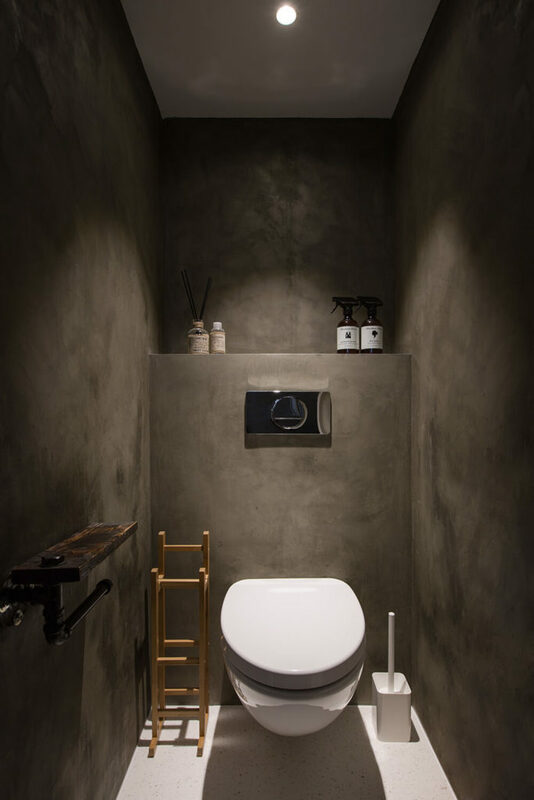 When we view the lengthy washroom area from the side, the reason for the deep sinks becomes apparent: the vanity countertop is set low, near the ground. This allows for the sinks to remain useful while the countertop leaves room for open space. 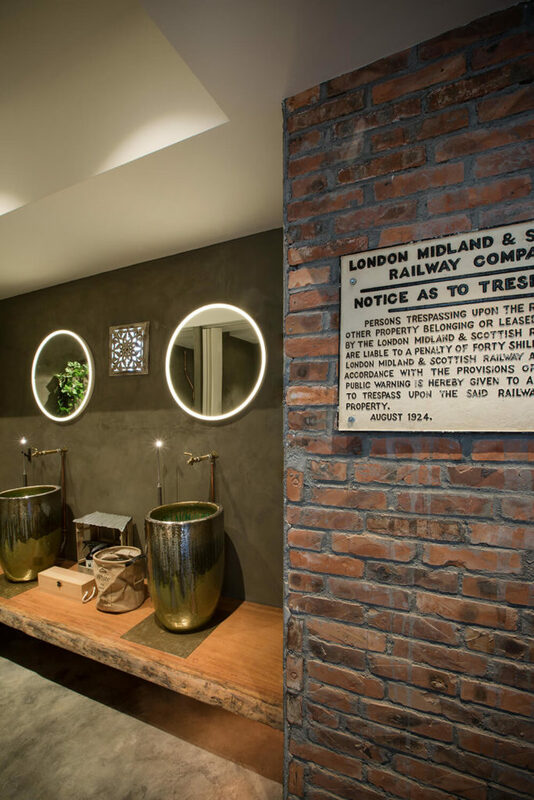 The pair of inner-lit disc mirrors act as the perfect complement to the vanity and vessel sinks, helping to further the uniquely timeless look of the office. 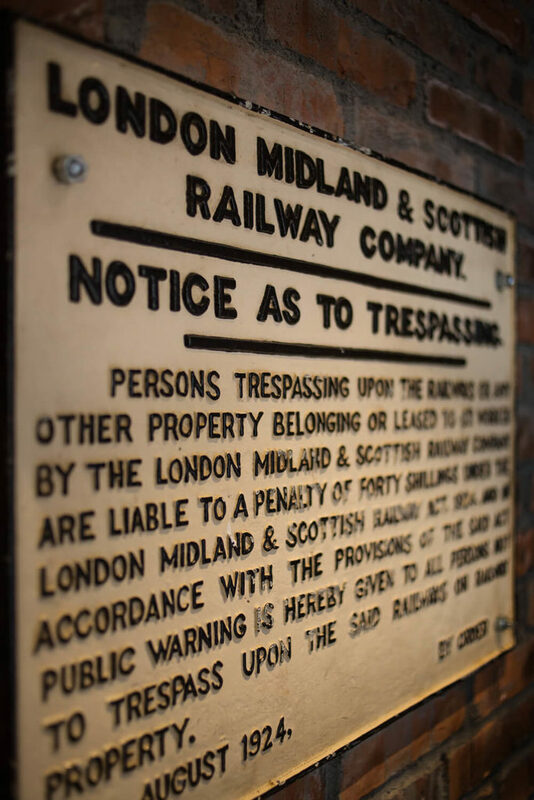 With this warning board, the source of the old fashioned signage surrounding the bathroom is revealed to be an old London railway station. Historical touches like this enhance the cross-generational appeal of the design. 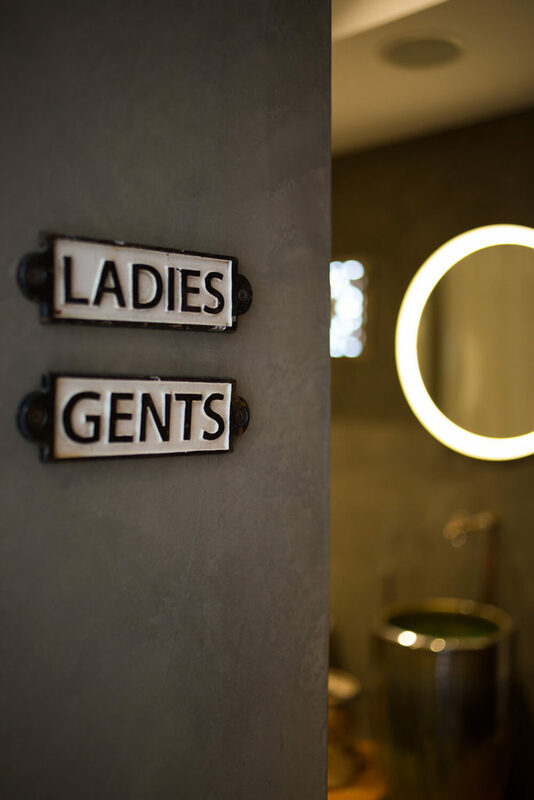 The individual bathrooms themselves are roomy spaces with full height dividing walls, perfect for extra privacy and making the bathroom more of an appealing escape from the busyness of the office itself. Grey walls and white tiled flooring provide simple but effective contrast. Here we see the cheeky way that the old fashioned signage is put to practical use. With the bathroom around the corner, these former railroad signs make a unique waypoint. 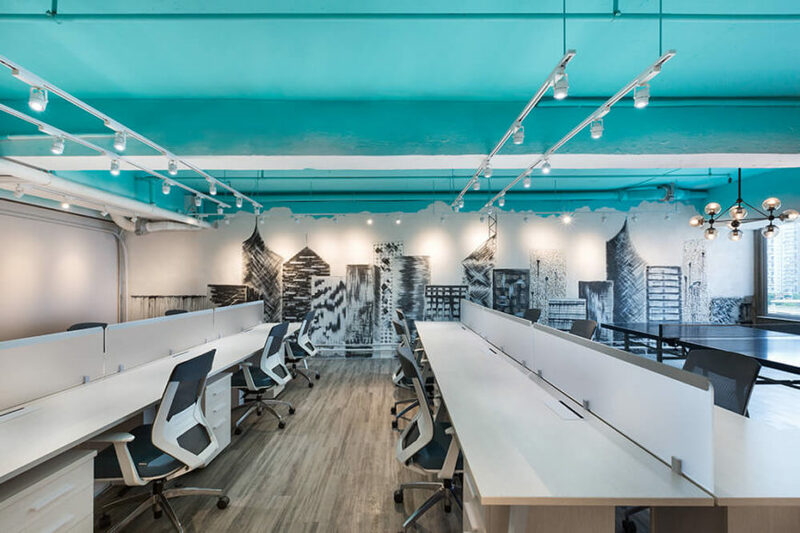 This private office stands apart from the rest of the design, with a massive window lending natural light to a space flush with rich and varied textural detail. 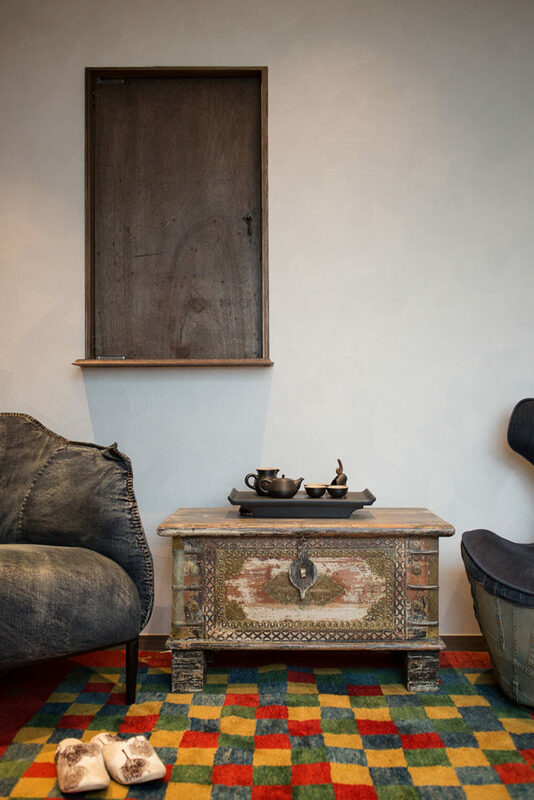 The large desk at center is a fresh combination of sleekly modern framing and traditional carved wood desktop. 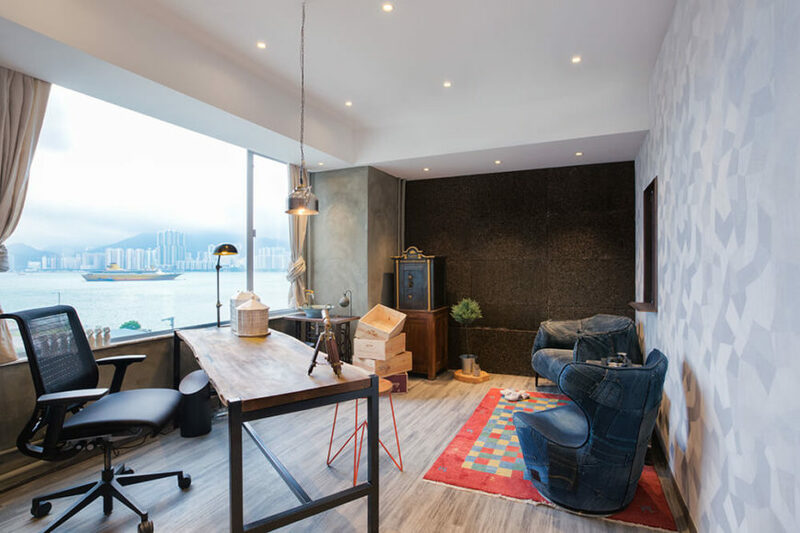 With this playful extension of the office space, we see a more serene, private area, stacked with unique furniture pieces and wall decoration. 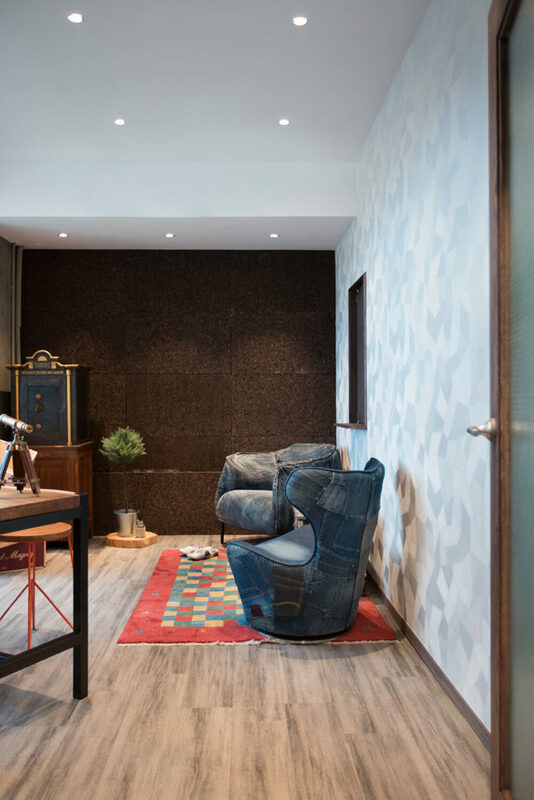 Check out the pair of club chairs upholstered in former denim jeans. A rainbow checkered rug centers on the hardwood flooring, with a repurposed old storage table at center. 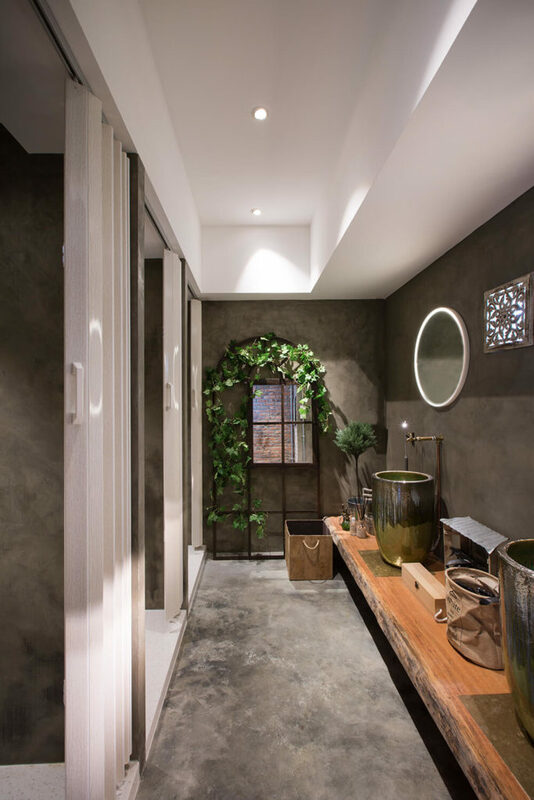 The wall sports a rustic wood door that acts as a portal into the next area. 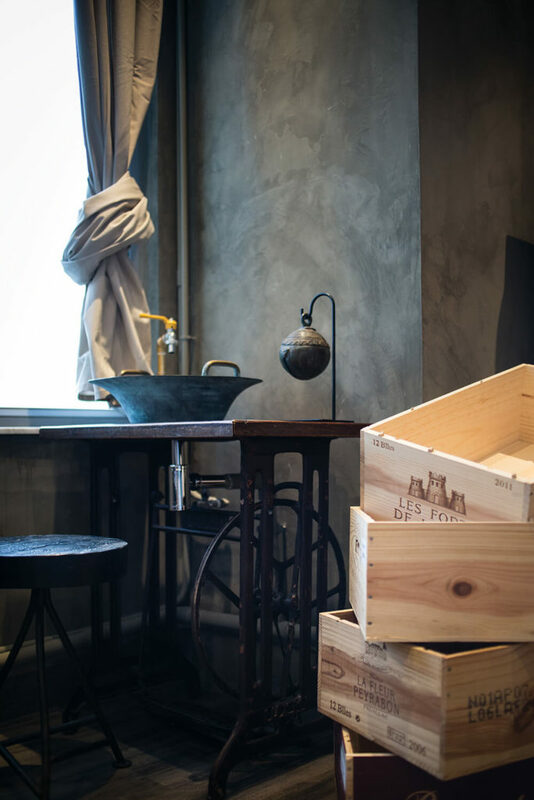 In the corner of the private office, we see a singular old-fashioned vanity made of wrought iron and wood, sporting a vessel sink in a standalone functional display. 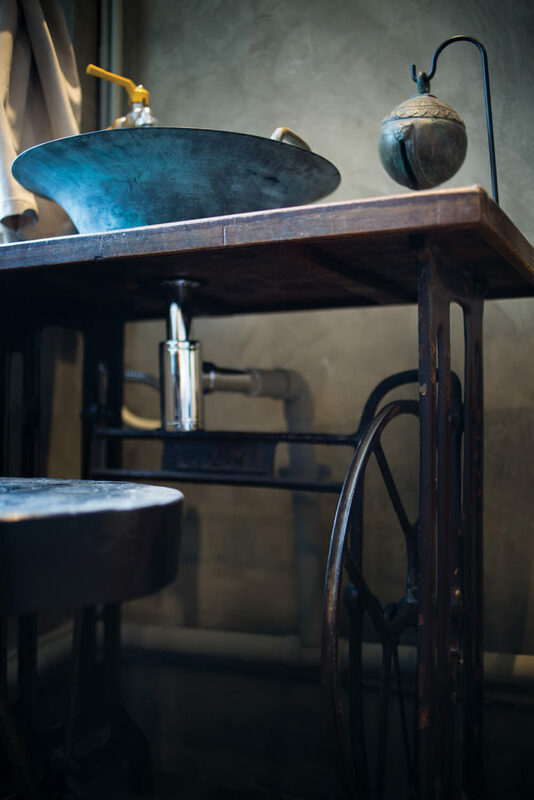 The vanity was crafted from a former sewing table, replete with old fashioned wheel still attached to the frame. Details like this are in clear abundance in the office. 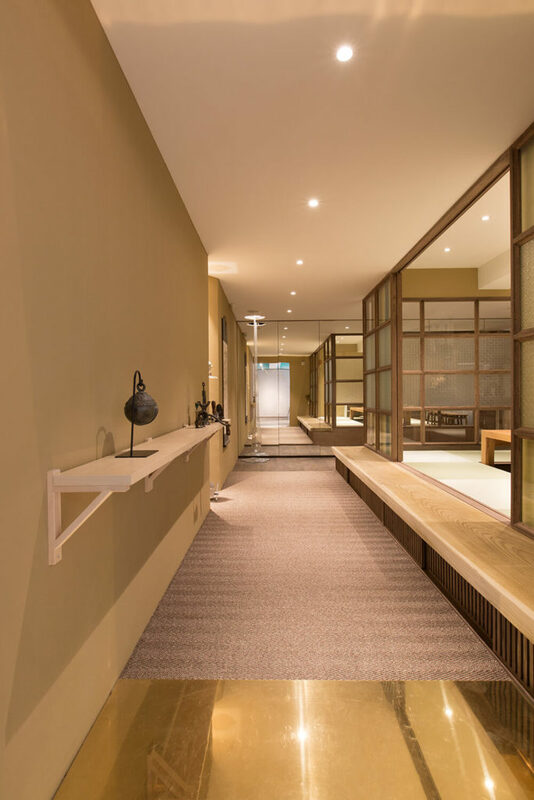 Moving down the hall toward the final major section of the office design, we see a bold spray of gold and natural wood tones, ushering in a completely new mood to the office. 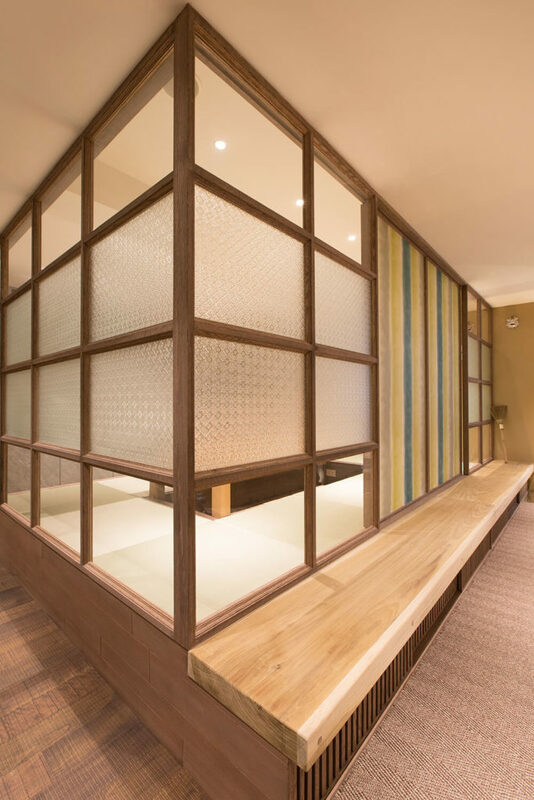 Here we see a corner of the shoji walls, mixing thin wood framing and textured glass for a futuristic take on the ancient architectural style. A unique water-drip glass sculpture hangs in the corner. 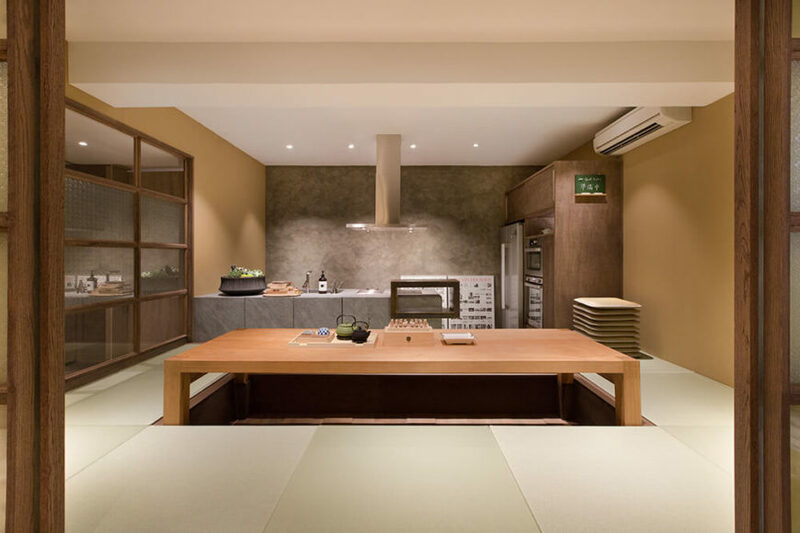 The kitchen area itself centers on a massive natural wood dining table, set into the ground for traditional dining arrangements. The functional half of the kitchen is tucked against the grey wall in the background. 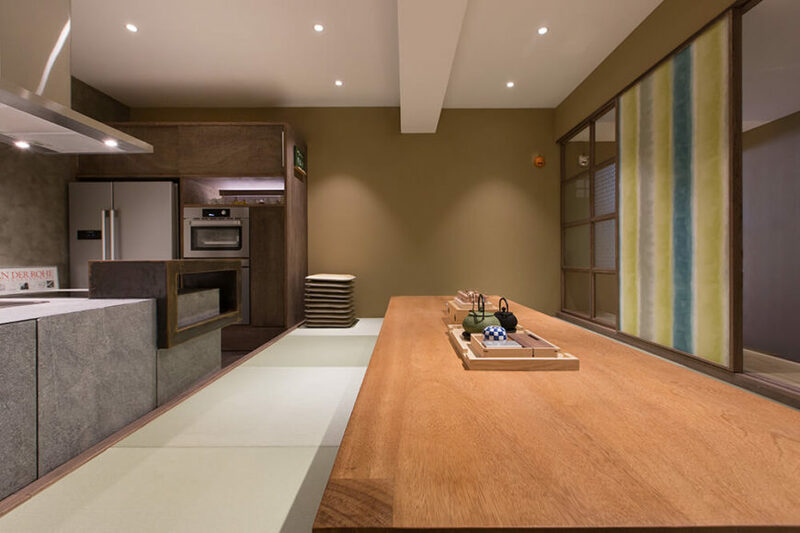 The rich wood of the table and far cabinetry contrasts with the concrete slabs and stainless steel appliances seen at left. Even the shoji wall holds a uniquely painted art panel. 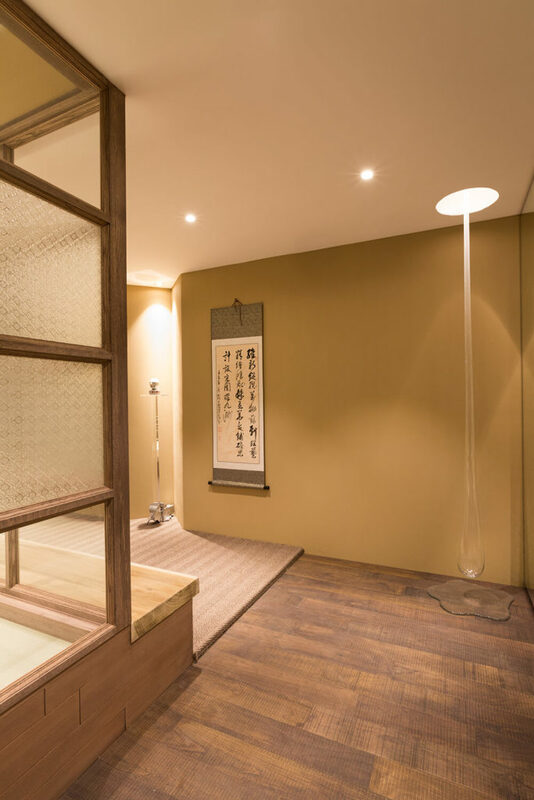 Through the textured glass shoji wall, we can see some of the hardwood flooring in the next room at left. The grey slab countertop helps define the kitchen, distinct from every other space in the office. 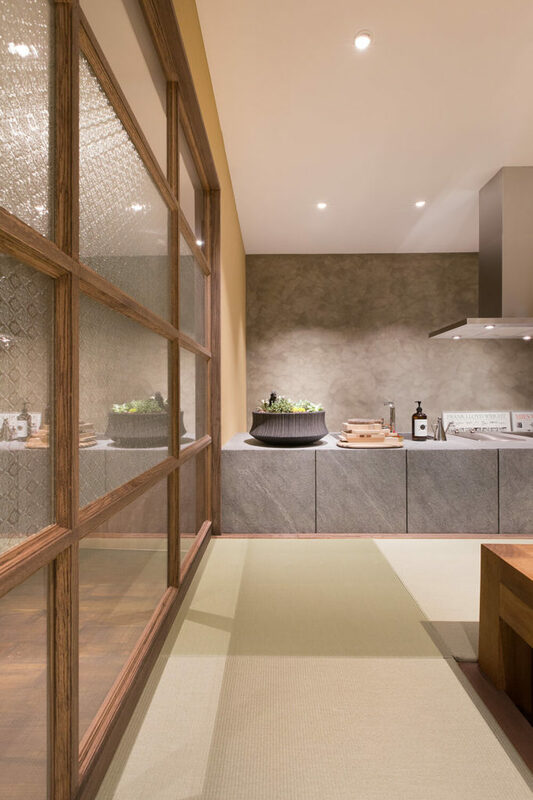 Here we see the area with the shoji walls completely shut, revealing the painted panels to be the doorway into the kitchen. Surrounding hardwood and a raised floor make it an utterly distinct space within the design.